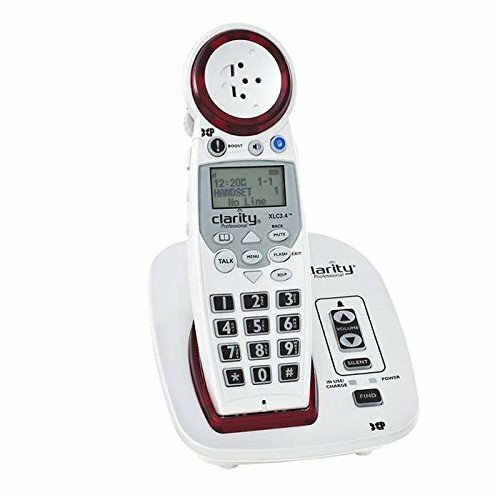 If you have a difficult time hearing the person on the other end of a phone call, even if you have the volume at maximum level, you may want to consider a phone that helps you with your conversation during the entire call. TeleDynamics' Clarity-XLC3.4+ will help you enjoy having a conversation on the phone thanks to features that will help you hear, see and speak better than before. The phone begins with an extra loud ringer with many adjustable tones. Other ways that optimize hearing during your conversation include a DCP amplification, which increases the volume by up to 50 decibels with up to four tone settings for maximum control. For a completely hands-free experience, the XLC has a crystal clear extra loud speaker phone available at the push of a button. For even more hearing assistance, the Clarity is able to connect directly to listening devices and headsets up to 3.5 mm. It's also hearing aid compatible and TIA-1083 compliant. Among the phone's many visual aids is the display on the caller ID, a light-up dial pad with larger buttons and a flashing light when calls are coming in. The ID displays in large print and is in high contrast when compared to a home phone. The ID is also illuminated for a better visual, so you can see who's calling you before picking up. 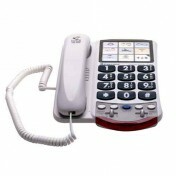 When making a call, a large dial pad complete with larger than normal buttons make dialing a much easier process. Being able to speak clearly for others is important as well. Controls allow you to amplify your voice by up to 15 decibels, assuring others will hear you loud and clear. Speakerphone also allows you to hear and be heard from anywhere in the room. The Clarity XLC comes with a dual power battery backup system that keeps the phone on when the power is out and can be expanded with up to three extra handsets. The Clarity comes with a one-year warranty.